Universal City, California, June 5, 2012 - The colorful and captivating world of Dr. Seuss bursts onto the screen as never before on August 7, 2012 in the hilarious and captivating adventure, Dr. Seuss' The Lorax from Universal Studios Home Entertainment. Available on Blu-ray(TM) 3D Combo Pack and Blu-ray(TM) Combo Pack -- both featuring DVD, Digital Copy and UltraViolet(TM) so you can watch it anytime, anywhere -- Dr. Seuss' The Lorax is non-stop family fun that includes three delightfully entertaining mini movies not shown in theaters,available only on the Blu-ray(TM) Combo Packs. The film will also be available on DVD and Digital Download. Dr. Seuss' The Lorax transports viewers into a fantastical landscape imagined by Dr. Seuss and vividly brought to life by Chris Meledandri and his acclaimed filmmaking team at Illumination Entertainment (Despicable Me). Directed by Chris Renaud (Despicable Me) from a screenplay adapted by Ken Daurio and Cinco Paul (Despicable Me, HOP, Horton Hears a Who) from the 1971 children's classic, the film is an imaginative journey that begins in the town of Thneedville, where a boy searches for the one thing he knows will win the heart of his dream girl. But in order find it, he must discover the story of the Lorax, the often grumpy but loveable protector of Truffula Valley, in an exciting adventure filled with comedy and heart that USA Today's Claudia Puig calls, "The right blend of funny, silly, and sweet." Danny DeVito ("It's Always Sunny in Philadelphia," Twins, L.A. Confidential) lends his unmistakable voice to the Lorax, the remarkable creature who "speaks for the trees," with Ed Helms (The Hangover, The Hangover Part II, "The Office") as his enigmatic nemesis, the Once-ler. The all-star cast also includes Zac Efron (High School Musical, The Lucky One, 17 Again) as Ted, an idealistic 12-year-old searching for the Lorax; Grammy(R) Award winner Taylor Swift (Valentine's Day) as Audrey, the girl of Ted's dreams; Rob Riggle (The Hangover, Big Miracle) as the villainous O'Hare; Jenny Slate (Alvin and the Chipmunks: Chipwrecked, "SNL") as Ted's protective mother; and five-time Emmy(R) Award winner Betty White (The Proposal, "Hot in Cleveland") as Ted's wise Grammy Norma. One of the best-selling children's book authors of all time, Theodor "Dr. Seuss"
Geisel created more than 40 cherished books that have been published in 95 countries and 17 different languages, selling more than half a billion books worldwide. The Lorax, which Geisel named his favorite work, is included on the "Educator's All Time Top 20 List of Children's Books." Dr. Seuss' The Lorax Combo Packs contain a Blu-ray(TM), DVD and a Digital Copy of the film compatible with iTunes(R), iPad(R), iPhone(R), iPod(TM), Android (or select online retailers), as well as UltraViolet(TM). UltraViolet(TM) is the revolutionary new way for consumers to collect movies and TV shows in the cloud to instantly stream and download to computers, tablets and smart phones. Consumers can now truly enjoy their movies anytime, anywhere on the platform of their choice. * Serenade -- Two Bar-ba-loots -- one love shy and the other suave and confident -- battle for the heart of their would-be sweetheart with the help of a colorful cast of characters, including the Humming-Fish and Swomme-Swans. * Wagon-Ho--Two Bar-ba-loots take The Once-ler's wagon on a ride they won't soon forget. * Forces of Nature--Determined to scare The Once-ler out of Truffula Valley, The Lorax decides to create the illusion of ominous forces of nature. *	MAKING OF THE MINI MOVIES--Go behind the scenes at Illumination Mac Guff to see the joys and challenges of continuing the characters' stories in the dynamic format of the mini movie. *	SEUSS TO SCREEN--A fascinating look into the translation of Seuss' iconic style from book into the big feature film canvas. *	SEUSS IT UP!-- A great tutorial on how to draw the Lorax, a Humming-Fish and a Bar-ba-loot in the unique Seuss style. *	TRUFFULA RUN--The player moves left and right to avoid obstacles while attempting to pick up berries with modes for easy, medium and hard. As difficulty increases, the player will have more obstacles to avoid. *	"LET IT GROW" SING ALONG-- Karaoke-style sing along to the end credit version of Let It Grow. *	ONCE-LER'S WAGON-- While the Once-ler is away peddling his wares, the curious forest creatures have fun with his belongings. Users can select an item for the creatures to mimic or play with and then watch the adorable antics of all the forest friends. *	GET OUT OF TOWN--In this game, the player must help Ted navigate through town on his scooter in order to make it to the Lerkim and meet the Once-ler. At the end of each level, Ted must solve an obstacle puzzle to advance to the next section. There are three levels and three puzzles to complete to win the game. *	O'HARE TV-- Watch the Lorax with hilarious commercial interruptions courtesy of O'Hare TV. *	EXPEDITION TO TRUFFULA VALLEY--Explore and navigate within the Truffula Valley to learn more about how the characters and creatures come to life. * ULTRAVIOLET(TM)--The revolutionary new way for consumers to collect movies and TV shows, store them in the cloud, and download and stream instantly to computers, tablets and smartphones. Currently available in the United States only. * DIGITAL COPY--Viewerscan redeem a digital version of the full-length movie from a choice of retail partners to watch on an array of electronic and portable devices. *	uHEAR(TM): Never miss another line of dialogue with this innovative feature that instantly skips back a few seconds on your Blu-ray(TM) disc and turns on the subtitles to highlight what you missed. * pocket BLU(TM) APP--The popular free pocket BLU(TM) app for smartphones is now even better with newly updated versions for iPad(R), Android(TM) tablets, PC and Macintosh computers, with features made especially to take advantage of the devices' larger screens and high resolution displays. The imaginative world of Dr. Seuss comes to life like never before in this visually spectacular adventure from the creators of Despicable Me! Twelve-year-old Ted will do anything to find a real live Truffula Tree in order to impress the girl of his dreams. As he embarks on his journey, Ted discovers the incredible story of the Lorax, a grumpy but charming creature who speaks for the trees. 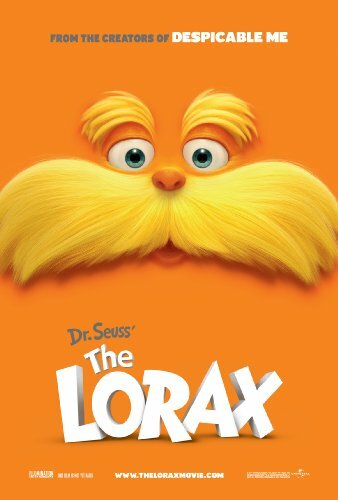 Featuring the voice talents of Danny DeVito, Ed Helms, Zac Efron, Taylor Swift, Rob Riggle, Jenny Slate and Betty White, Dr. Seuss' The Lorax is filled with hilarious fun for everyone! Dr. Seuss' The Lorax is the third feature created by Universal Pictures and Illumination Entertainment (Despicable Me, Hop). In honor of its Centennial anniversary, Universal Pictures proudly salutes 100 years ofunforgettable films that have entertained audiences and touched the hearts of millions around the globe. In celebration of our first 100 years, UniversalStudios Home Entertainment is proud to present a selection of our many beloved movies as part of an extensive year-long program that underscores the studio's rich cinematic history and indelible cultural impact. Universal Studios Home Entertainment is a unit of Universal Pictures, a division of Universal Studios (www.universalstudios.com). Universal Studios is a part of NBCUniversal, one of the world's leading media and entertainment companies in the development, production and marketing ofentertainment, news and information to a global audience. NBCUniversal owns and operates a valuable portfolio of news and entertainment television networks, a premier motion picture company, significant television production operations, a leading television stationsgroup and world-renowned theme parks. Comcast Corporation owns a controlling 51% interest in NBCUniversal, with GE holding a 49% stake.